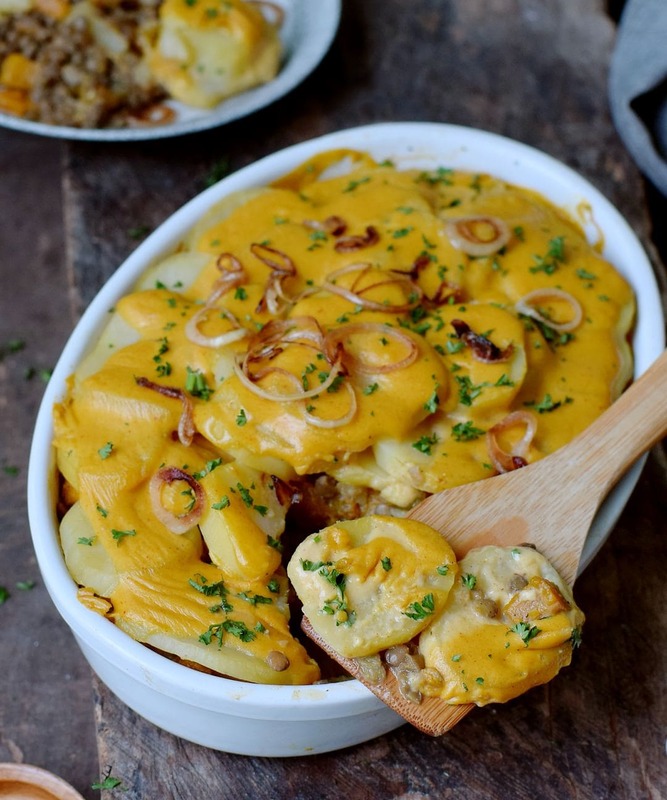 Fall calls for comfort meals and comfort meals call for potatoes! 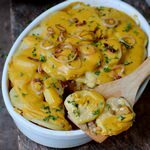 You guys, this vegan potato bake is a must try, especially if you love casserole recipes as much as I do. This hearty dish is not only plant-based, but it’s also gluten-free, easy to make and rich in protein. 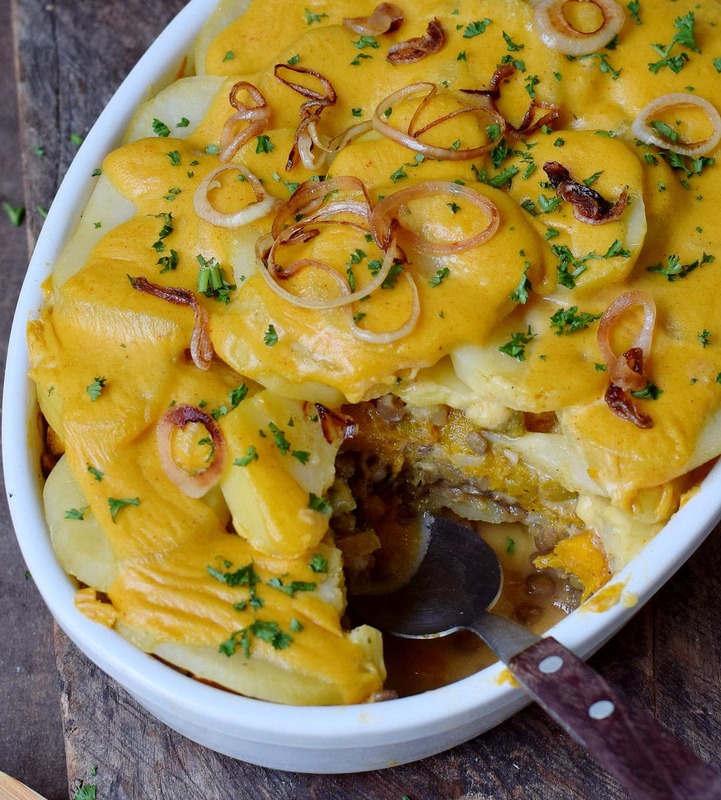 Since pumpkin is in season right now, I decided to make this vegan potato bake with pumpkin. Potatoes and pumpkin go so well together, so I thought it would be a nice addition. And because I love to add healthy protein to my vegan recipes, I included lentils as well. Lentils are packed with healthy plant-based protein and cook fast, which is a big bonus. I love hearty recipes and comfort food so much, especially when it gets colder outside. To make this recipe creamy I’ve added vegan cheese (I used my easy vegan cheese sauce) and vegan cream cheese. I also added various spices and herbs for an amazing flavor because nobody likes recipes which taste bland. This recipe doesn’t contain many ingredients. Furthermore, the few ingredients can be bought in every supermarket. Nothing fancy or special. 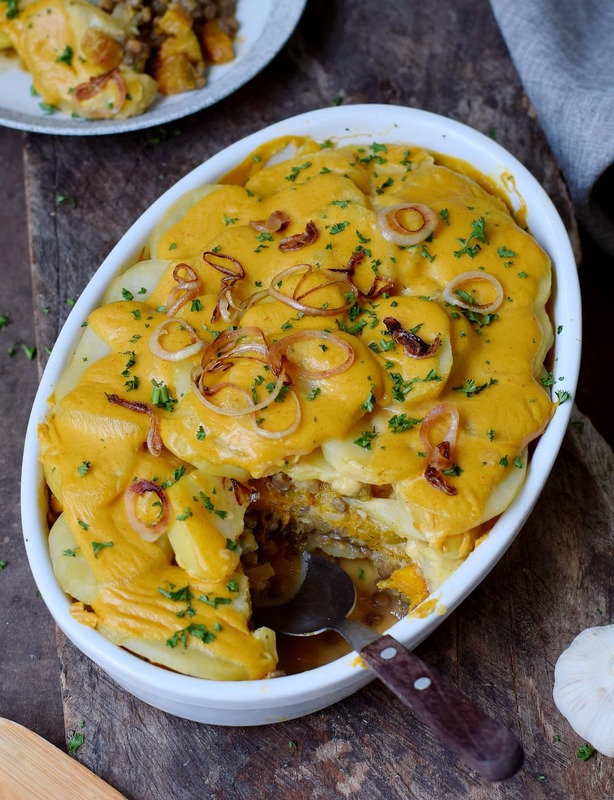 This vegan potato bake is easy to make and ready in less than 45 minutes. 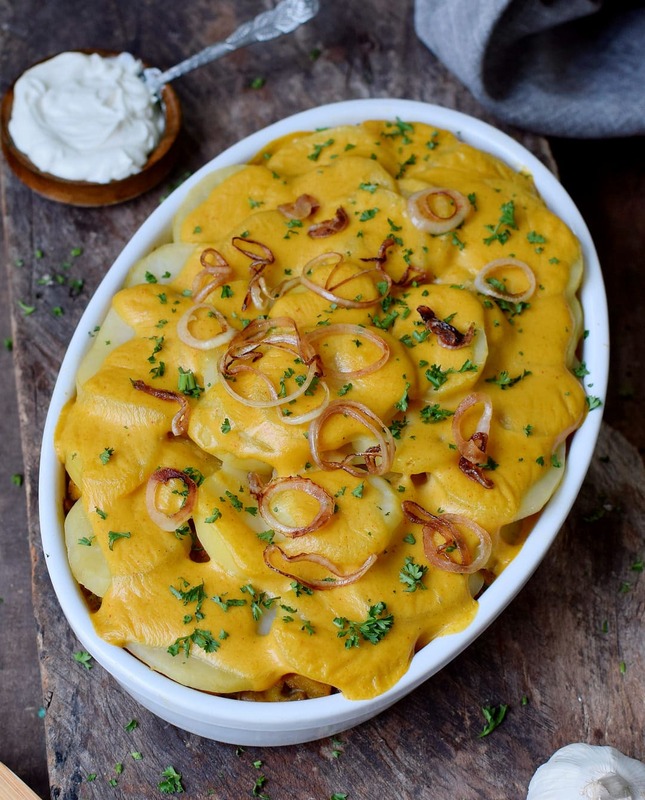 As mentioned before, this vegan potato casserole can be made with fresh pumpkin, however, you can also use sweet potato or carrot instead. All variations taste delicious and are healthy. Also, if you love casseroles, you should definitely check out my healthy vegan pasta bake as well. It’s hearty, creamy and furthermore low in fat! 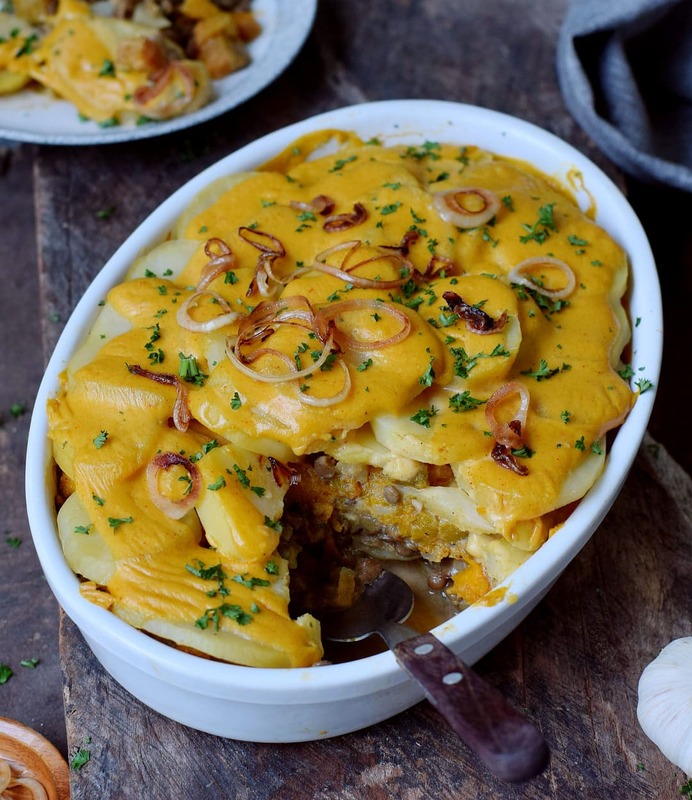 This hearty vegan potato bake with pumpkin and lentils is a great fall recipe. It's a wonderful comfort meal and perfect for dinner or lunch. 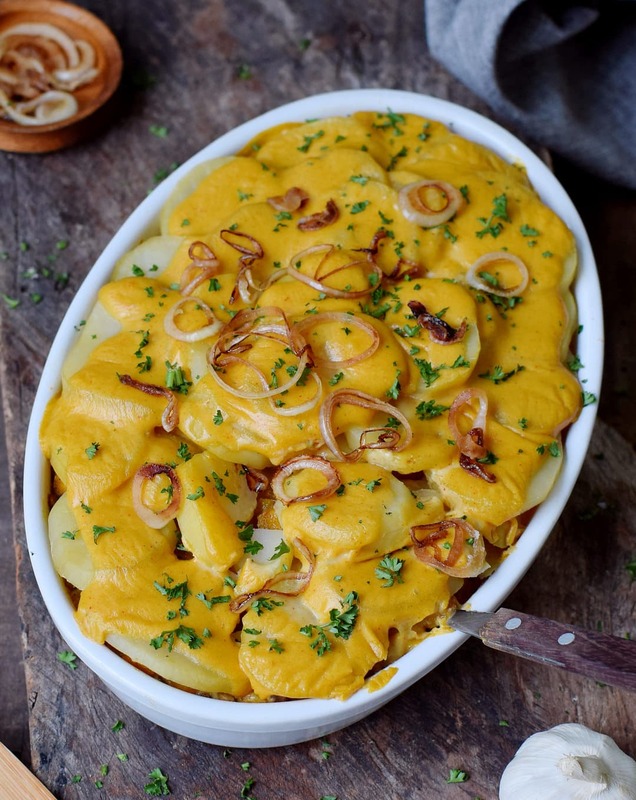 The potato casserole is furthermore gluten-free and easy to make. Rinse lentils under running water. I prefer to soak the lentils for about 10-15 minutes in lukewarm water because they are better digested this way (this step is optional). Drain the water afterwards. Meanwhile, peel and slice potatoes about 0.25 inches thick (0,6 cm). Cook in salted water for 12 minutes or until fork tender (but not too soft). Chop the pumpkin, onion, and garlic. Heat 1/2 tbsp oil in a pot, stir in the onion and fry for about 3-4 minutes over medium heat. Add garlic, all spices, the lentils and 2 cups of vegetable broth. Bring to a boil and let simmer for about 15 minutes or until there is no water left in the pot. While the lentils cook, you can prepare the vegan cheese sauce (or use store-bought vegan queso instead). Next, add the vegan cream cheese to the vegan cheese sauce and stir with a whisk. Toss the pumpkin with the other half tbsp of oil and fry in a pan for 3-5 minutes. 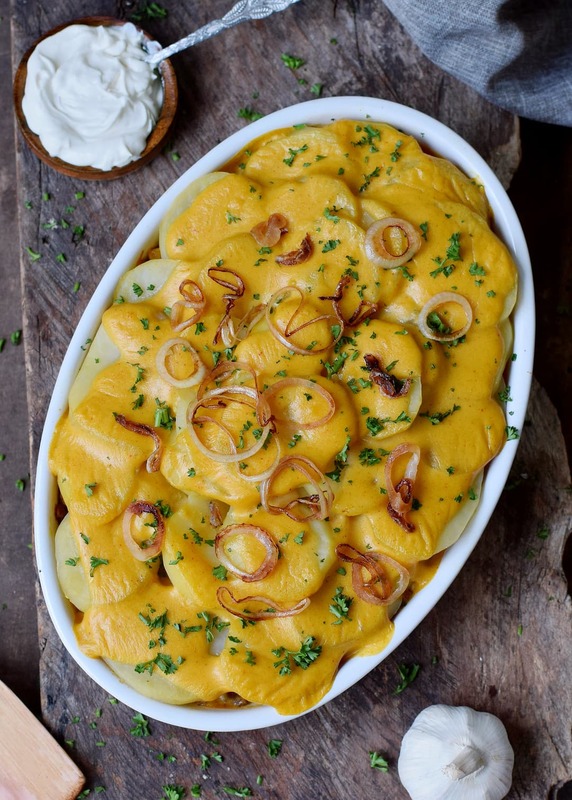 Add a layer of the cooked potato slices into a greased baking dish. Then add the cooked lentil mixture. Now pour about half of the vegan cheese sauce/cream cheese mixture on top. Add the pumpkin cubes and the remaining potato slices. Finally, pour the other half of the vegan cheese sauce/cream cheese mixture on top. Cook in the oven for about 25 minutes. Garnish with fresh herbs (e.g. parsley). Enjoy! Such a delicious recipe, my dear Ela!???? Will definitely try it soon! Can I leave out the vegan cream cheese, and just make 2 batches of the vegan cheese sauce instead? Do you have the nutritional value available? How many grams of CFP per serving? I make this dish often for our whole family and it really delicious! Also easy to exchange the vegetables in case you don’t have pumpkin at home. I have used carrots, chickpeas, zucchini and each time it is a hit! Thank you for all your yummy and healthy recipes. I’ve tried this recipe, and it’s amazingly delicious, an interesting mixture of flavours. You are very talented. I want to ask how I can make home made cream cheese. Because its not available in the market where I live. Soooooooooooooo good , this is delicious!!!! Baked it yesterday, first of many 🙂 Thank you Ela!! Do you have a recipe for the vegan cream cheese as well? I am staying away from processed food so I don’t want to buy it in a store.